Electrical stimulation of the brain is common practice in neuroscience research and is an increasingly common and effective clinical therapy for a variety of neurological disorders. However, there is limited understanding of why this treatment works at the neural level. A paper published by McGowan Institute for Regenerative Medicine affiliated faculty member Takashi Kozai, PhD, assistant professor of bioengineering at the University of Pittsburgh Swanson School of Engineering, addresses gaps in knowledge over the activation and inactivation of neural elements that affect the desired responses to neuromodulation. The article, “Calcium activation of cortical neurons by continuous electrical stimulation: Frequency dependence, temporal fidelity, and activation density,” was published in Neuroscience Research. Co-investigator is Kip Ludwig, PhD, associate professor of biomedical engineering at the University of Wisconsin-Madison. For this study, Dr. Kozai’s group – the BIONIC Lab – used in vivo two-photon microscopy to capture neuronal calcium activity in the somatosensory cortex during 30 seconds of continuous electrical stimulation at varying frequencies. They imaged the population of neurons surrounding the implanted electrode and discovered that frequency played a role in neural activation – a finding that conflicted with earlier studies. “Electrical stimulation has a large number of parameters that can be used to activate neurons, such as amplitude, pulsewidth, waveform shapes, and frequency,” explained Dr. Kozai. “This makes it difficult to compare studies because different stimulation parameters are used in other studies. Based on the parameters that were previously employed, it was thought that activation occurs in a sphere centered around the electrode where neurons near the electrode would activate more than neurons far from the electrode. According to Dr. Kozai, the fact that researchers can use varying stimulation parameters to activate different neurons in the same location has huge implications in basic science research. The findings will allow them to activate different neural circuits with the same implant to elicit different behaviors. Beyond its research applications, Dr. Kozai believes that this knowledge may also help in clinical settings. Dr. Kozai believes that more research needs to be done to understand neuronal activation properties and hopes that this work will lead to new tools in neuroscience and improved neuromodulation therapy by explaining why electrical stimulation produces its effective responses. 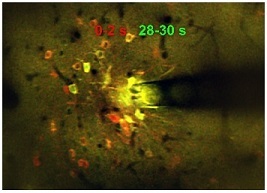 Illustration: Microstimulation (130 Hz, 30 s) in a mouse cortex produced a spatiotemporal response, activating a sparse population of neurons only at the onset of stimulation (red), and a dense population of neurons throughout the stimulation duration (yellow). Photo credit: NJ Michelson & TDY Kozai/BionicLab.